Racing is an exact example of a challenge. And one must have his own secrets to win or be humiliated if lost. Check on the following steps which would help you breed the best among the best of champions. 1. Choose the breed that wins. Since you want to join in racing, your obvious purpose is to win. Your pigeon must know how to come home after the race, it must be capable of coming back home and must have interest of getting back home. 2. Choose the racing breed. An apple won’t produce a strawberry. What does it mean? It means if you do not have any pigeons with racing gene, you would never produce it whatever kind of breeding you do. So you better get it for a chance of winning the race. 3. Test your pigeons patiently. Don’t rely with one result but when you see it on the third time, then you’ve got to pay attention to it. So if you didn’t see valuable results after placing at least 10 of their babies in tests, you’ve got to cull your breeders. If you started to breed for 200, then focus to the top 2. That’s really choosing the best or to give allowance, you may consider until 10. Culling for more than this ratio will not get you successful. 5. Strengthening of genetic contribution. Inbreeding increases the genetic contribution of your chosen breeders. It provides more predictability because you narrow the gene pool. It also lessens variability on their babies. With this process, you introduce a new bloodline into your flock which would enhance their qualities. Those steps are very challenging and involve a lot of patience and perseverance. After all, that’s all that’s necessary when you want to achieve the best of racing pigeons. It’s all in their blood! Check on the following list of champion breeds that have proved their winning records from their parents down to their offsprings. Undoubtedly, this breed comes from the family of 1st place race winner. Winning is definitely on its blood. When it comes to short and middle distance racing, Black Diamonds are people’s choice. This breed comes from a great bloodline with its notable characteristics in terms of feathers and muscles. This breed has champion origins which surely run through their successor along the line. This pigeon breed has proven to produce top racers for long distance category. Ancestors of this pigeon breed have shown great records of winning. Being the champion is first on its vocabulary. From its ancestors to different successors, Van der Maelen’s winning characteristic has been consistent and can be seen clearly. When you look on its pedigree, you’ll know this pigeon breed is definitely created to win the race. There you have them, the leaders of race themselves! Although there are a lot more numbers of racing pigeons available these days, we only mentioned the few that have been acknowledge for their superb winning records. well. Take note of the following caring tips that you should apply to your birds after the race. After the race, wash your pigeon’s feet with warm water as well as their feathers. By washing or cleaning them, you’ll be able to wipe out the germs they could have acquired from the other pigeons that joined the race. · If the race was a long one, your birds would definitely need to feed, particularly in the morning as they arrived and then main feed should follow in the evening. · Do not forget that pigeons need to rest after the race. Have them relax for at least 1 ½ days (36 hours) once the race is done. This way their muscles recover and gain full potency which are essential for the next training and race schedule. Racing pigeons have their own distinctive muscle strengths in order to endure the challenge of the race so their owners must always remember how to take care of them properly. Since it involves energy in order to fly, pigeons must be regularly checked and monitored if they are getting the right nutrient at the right amount in order to soar smoothly. For the first few minutes of their flying, race pigeons would not last unless they’ve got sufficient carbohydrates. They mostly need feed with loads of carbohydrates if they are to race for short distances. Fats store energy while it’s not in use. When it comes to racing, carbohydrates would be consumed immediately so fats are necessary so that for the next few distances, your pigeons still have energy to use. When it’s a long distance race, include feeds with fat contents. We all know that protein does a lot of wonders when it comes to maintaining and repairing muscles but it does not stop there. It also improves fertility and hatchability which are very helpful in breeding. The known ideal mix of protein in feeds is 18% at most. Going beyond this mixture does not show any drastic development, although there’s no negative implications have been seen as well. Responsibility is one major concern when it comes to maintaining racing pigeons that’s why it must be taken seriously, with full attention and great passion. Are we able to input a lot of knowledge with this article? Share what you’ve learned about racing pigeons to your friends and tell us what else you know by filling in the comments section. 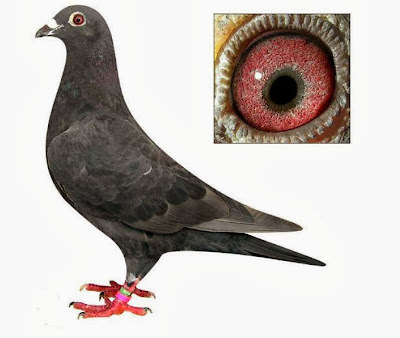 The homing pigeons is a variety of domestic pigeon (Columba livia domestica) derived from the rock pigeon, selectively bred for its ability to find its way home over extremely long distances. Thanks, it's a decent article for a beginner introduction to breeding, I like the section about nutrients. If anyone is looking for something a bit more in-depth regarding breeding techniques such as cross-breeding or line-breeding. We have a guide here on breeding racing pigeons.